To grow weld, I find that it is difficult to direct-sow. The seeds are incredibly small, and need to be kept consistently mois while germinating. I usually start the seeds in small pots and transplant them when they’re big enough. The plant has a taproot, so transplant carefully. Weld prefers alkaline soil, and you can add chalk or lime to your bed if your soil is acidic. I am fairly certain that only the black seeds are viable, but it is hard to to separate the green and tan seeds efficiently, so I just plant a pinch of mixed seed and thin the seedlings if necessary. Wherever you put it in your garden, be sure to leave space for much larger plants in the second year. The leaves are long and thin with wavy edges. You can use the leaves in the first year by cutting them close to the center of the plant. The quantity of plant material that you can gather in the first year is relatively small, though, so I usually wait until the second year to harvest weld. In its second year, weld sends up a tall woody stalk that can get as high as 5 feet. It produces tons of tiny creamy-colored flowers that are attractive to bees and other insects. It is easy to save your own seed, though cleaning it can be a chore. Some dyers find that letting the plants go to seed produces an unwanted abundance of volunteer weld seedlings. In my experience, I get at most one or two volunteers a year, which is manageable. If you are saving seed, wait until you can see dark colored seeds at the lowest part of the flowering stalk before harvesting. The flower stalks keep adding new flowers at the tip, while the seeds mature at the base. You can use weld fresh, or dry it for future use. I hang it upside down from a laundry-drying rack to dry. In some years, I have noticed a strong smell as the weld dries. It is not to everyone’s liking, so be prepared to dry it with ventilation or move your drying set-up if the smell becomes objectionable. Once it’s dry, chop up the plant material to reduce the bulk, and store it in a dry location until you are ready to use it. I usually put dried weld in a paper bag to absorb any condensation when there are temperature fluctuations, and seal that inside a plastic bag. It also keeps well in a cardboard box. To read about my seed saving and germination experiments, please visit my blog Local Color Dyes. Today was the last in a series of 4 talks given at Sheep and Shawl. Thanks to Liz and John for hosting these wonderful talks. Michelle did a wonderful job of explaining the planting and finishing process of Flax. I wanted to share with you pictures of this event. Everyone who wanted to got a chance to try their hand at it and see many wonder samples from the plant itself to the finished product. Michelle using a Flax Brake. This brakes the fiber from the stem. Michelle using the Heckle. The heckle splits and straightens flax fibers for spinning. Depending on the type, flax will start to bloom between 37 and 45 days after planting. Flax flowers open in the morning, and the petals fall off by mid-day. Each flower only lasts a day. Flax is indeterminate, which means that once it starts to bloom, it will keep blooming until you harvest it. For fiber, pull flax before the seeds are mature, between 90-100 days after planting. The exact timing will depend on the weather. If it’s hot and dry, the plants will mature more quickly. When you harvest, the plants will still be flowering. The bottom third to a half of the stalks will be yellow and there will be green and tan seed bolls. You may have a few mature seeds at this point, but not a lot. If you want to save some plants for seed, let them grow until the seed bolls are dark brown. Watch out for birds and rodents, as flax seeds are very oily and desirable. The seed pods can also fall off or pop open when they are ripe, so keep an eye on your seeds. Botanists consider flax self-pollinated and don’t tend to worry about cross-pollination between two types. However, flax flowers are definitely visited by nectar-hungry insects so I recommend separating types by distance or physical isolation. Pull up the entire plant by the roots. The roots are not deep, and the fibers continue down into the roots. Line up the root ends as evenly as you can and tie the bundles together tightly with strong twine. I make my bundles about as thick as my forearm. The plants will shrink significantly as they dry, so I tie the bundles very tightly to start with. Then, let the bundles dry. The traditional way is to stack them up in a little tent-shape structure called a stook and leave them in the field, but I usually hang mine from the laundry line or a fence to dry. Put them under cover if it rains. Once the bundles are dry you can store the flax as long as necessary before proceeding to processing. As the plants dry they will shed a lot of leaves, petals, and dirt, so put them someplace that can get messy. The seeds on the bundles, even immature seeds, will attract mice and other rodents, so be alert. Dried flax is called “straw”. Retting is the trickiest part of the process, and judging when flax is properly retted takes experience. Retting is a controlled rotting process that releases the flax fibers from the rest of the stem. Flax is a bast fiber, meaning that the fibers are in the stem of the plant. Two traditional ways to ret are dew retting and water retting. With dew retting, you open up the dried bundles of flax and spread the straw on a grassy field in rows. You flip the rows over periodically so all sides of the plant ret evenly. Fungi slowly consume the pectins that hold the fibers to the woody material of the stalk, and also release the waxy cuticle from the outside of the stalk. The fungi occur naturally in the plants or in the soil, but not every field has the right make-up of micro-organisms conducive to dew retting. Dew retting can take several weeks and is weather dependent. If the weather is very dry, you will have to sprinkle the stalks with water. If it’s very rainy, you run the risk of rotting the stalks. When the silvery-gray fibers start to look wispy, it’s ready. My first attempt to dew ret (during a rainy, cold fall) was a disaster, and I have only done water retting since then. With water retting, a combination of aerobic and anaerobic bacteria consume the pectins that hold together the layers of the stalk. The bacteria occur naturally on the plants. The speed at which retting occurs is dependent on temperature and water quality. Traditionally water retting was done in ponds or dammed-up sections of a stream or river. Since water-retting is a bacterial process, it makes the water quality foul. I use stock watering tanks. I have a 50 gallon tank and a 100 gallon tank. The 100 gallon tank holds a lot, but it also takes a lot of water to fill it. Water retting takes anywhere from 6 to ten days when done in the summer or early fall. I fill up the tank with water, and wait for it to off-gas (I’m on town water) overnight. I suspect that the chlorine or other chemicals in the water inhibit the growth of the bacteria. Then I submerge the bundles and weight them down with boards, bricks, or milk-crates full of buckets of water. if you don’t submerge the bundles, they will float. They need to be under at least 3 inches inches of water to ret properly. Once it’s clear the bacteria are active, change a portion of the water every day (up to a third of the water, depending whose recommendations you read). Some years I haven’t changed the water at all, in the hopes that I could speed up the process and save water. However, adding fresh water maintains a certain balance of oxygen, which I suspect leads to better retting. Why does retting matter so much? The problem with under- or over-retting is that it really affects fiber quality. If it’s under-retted, it is extremely difficult to get the fibers clean and ready to spin, and if it’s over retted the fibers will break. There are many tests to determine if the retting is complete. Honestly, it’s the kind of thing you just have to try for yourself. Someone else’s test might not work for you. After a few days, test the straw a couple times a day. Pull out a few stalks and bend or break them to assess how easily the fiber pulls away from the woody core. I find that when I lift the bundles out of the retting tank, a certain degree of floppiness or relaxation of the bundles is a good sign that it’s retted. You can also pull out and dry a few stalks then break them and see if the fiber pulls away easily. Once retting is complete, I drain the tanks, rinse off the straw, and hang or lay out the bundles to dry. Be careful not to rub or agitate the bundles too much when rinsing. The loosened fibers can get tangled and then they just stick together and break off when you do to the next stages of processing. Water retting produces a lighter color fiber (yellow or white) than dew retting (silver or gray). Once the retted straw is dry you “brake” or “break” it with a tool called a flax brake (or break). This tool looks sort of like a saw-horse, with an arm that you can swing down onto the stalks to crush them. The woody material shatters and falls off, and the fibers are released. The small pieces of woody material are called shives or boon. After that, you “scutch” or “swingle” the fibers to scrape off any remaining woody pieces. Traditionally this was done with a vertical board and a scutching knife or sword made of wood. You hold the bundle of fiber tightly in your fist and whack it with the sword, taking care not to whack your thumb! After the fiber is clean, you draw the bundles of fiber through a series of “hetchels” or “hackles” with sharp tines. The sharp metal tines pull out the shorter fibers, or tow, and align the long fibers for spinning. The long flax fibers are known as “line” and a nicely aligned handful of line is known as a strick. At this point you can twist up the strick for safe keeping, or commence directly to spinning. I am not a proficient flax spinner, so I will leave that topic to someone else! This post is written by Michelle Parrish. Her passion is growing and using dye and fiber plants. She dyes, weaves, spins, and intermittently blogs at http://www.localcolordyes.com and is a member of the New England Flax and Linen Study Group. Michelle is admittedly somewhat obsessed with flax, especially growing and learning to process it. Despite the strong smells, time consuming and arduous labor, and occasional disasters associated with growing and processing flax, she finds it compelling and fascinating. She hopes to promote this beautiful plant with an ancient history and to make it accessible to people as an option for locally grown fiber. In my last post I wrote about acquiring fiber flax seed. As I mentioned, two places that carry the type called Marilyn are the Zinzendorfs at the Hermitage (http://flaxforsale.com/html/the_store.html) and Landis Valley Historical Museum (http://www.landisvalleymuseum.org/index.php/programs/heirloom-seed-project/. Both places sell seed by the pound, treated with a fungicide. Richters Herbs in Canada has a fiber flax type called Evelin. In my experience, Evelin doesn’t get as tall as Marilyn but also doesn’t lodge (fall over) as easily. Richters used to sell it in bulk, but they had a crop failure a couple years ago and now they just sell small packets (https://www.richters.com/Web_store/web_store.cgi?product=X2702&show=all&prodclass=&cart_id=5567986.23247). I do not recommend Richters’ generic flax for fiber; I found it short and branchy, and I believe it is more a seed than fiber type. Black Cat Farmstead in Wisconsin also sells fiber flax seed. According to their website they usually grow Evelin (http://www.blackcatfarmstead.com/BlackCatFarmstead_Shop.html). Both Richters and Black Cat sell untreated seed. Another place to get flax seed in small quantities is through the Seed Savers Exchange (http://www.seedsavers.org/). You have to become a member to participate but it’s a great organization and it’s worth joining if you are a gardener. Members of SSE offer additional fiber flax types including Cascade, Ariane, and an Irish heritage type called Sussex. Flax is planted early in the spring as soon as the ground can be worked. It is frost hardy and does best with very moist soil. If we get an early hot spell, you’ll have to water daily to keep the soil damp so the seeds will germinate. Mid-April is usually a good time to plant around here, though you can plant until mid-May with good results. Planting early helps flax outcompete weeds and results in a higher yield of fiber. I don’t recommend planting late and harvesting late (e.g. waiting until June or July to plant and harvesting in Sept. or Oct.) Flax doesn’t like hot weather. Also, it can lodge (fall over) really badly in heavy rain or high winds, like we sometimes get with summer thunderstorms or hurricanes. If you have lot of control over where you plant, a protected spot where things tend to be cooler is best. What’s the problem with lodging? The plants fall over and don’t spring back up. They become curved, tangled, and hard to harvest. Plants are more prone to lodging if there is a lot of nitrogen in the soil, but that’s not the only factor. In my experience, density of planting has something to do with it, too. You are supposed to plant very densely in order to force the plants to grow tall and straight with a minimum amount of branching. What’s the problem with branching? At each point that a stalk branches, the fiber will break in processing. The highest quality or most desirable fibers are the long “line” fibers, which allow for spinning a fine, strong, smooth thread or yarn. The shorter fibers are known as “tow” and while they are still useful for spinning, they produce a hairier yarn. On the other hand, if you are growing flax to save seed, you want to encourage branching and maximize your quantity of seed. Recommended broadcast rates vary. I’ve typically planted a pound of seed per 225 square feet, but the Zinzendorfs recommend a pound per 100 square feet. Commercial seeding rates vary. I’ve read everything from 1000 – 2000 plants per square meter (10.76 square feet), and if you’ve got acres to plant you will need 90-100 pounds per acre. On a smaller scale, recommendations include 120 plants per square foot, or 1 plant per 5 square centimeters (.78 square inches). The best place to start to decide on planting density is to follow whatever the recommendations are that come with your seed. Over several seasons you might find that you need less or more, depending on your site. The seed bed should be dug over well and made as smooth and level as you can. Flax seed is traditionally broadcast. This is not an easy skill to learn and experienced broadcast sowers were valuable in pre-industrial farming communities. When I broadcast I tend to get clumps and bald spots; my planting density is seldom consistent. Commercial farms use a drill. One helpful suggestion I read is to divide your seed in half, and spread half in one direction (say across the bed) and the other half in the other direction. Traditionally flax was sown as a field crop, but in my small-scale garden I sow in long beds 5 feet wide. It gets hard to reach in to water and weed if the beds are wider than that. The plants at the edges of the bed tend to be thicker and coarser, but that’s an acceptable trade-off for convenience in my opinion. After you sow, cover the seed with additional soil or rake it in, and press down firmly on the bed. A planting depth of an inch or so is good. I usually cover my beds with row cover until I see the seedlings come up, to discourage birds or other seed-eaters. Seedlings should emerge within 5-7 days. At this point I often fill in bald spots with additional seed. I’ve read that traditionally flax was weeded once when the plants were small (less than 6 inches high), and that at this young age they will bounce back from being stepped on. I haven’t found this to be true. I try not to step on the plants at all. if I plant early enough, there are not a lot of weeds coming up yet when the plants are that small. Grasses which are coming up from the roots will be up that early, but other weeds that are germinating from seeds emerge later. Instead, I weed throughout the season as new types of weeds start to grow. Today, Michelle Parrish grower of flax here in Western Massachusetts and dyer and weaver is writing about her adventures. Michelle Parrish is a weaver, natural dyer, and spinner, who has been growing flax for over ten years. She is a member of the New England Flax and Linen Study Group, and an organizer of the upcoming symposium Flax and Linen: Following the Thread From Past to Present. On February 28th at Sheep and Shawl in Deerfield from 1-3, she will explain the steps involved in growing and processing flax, and share some of her research into different varieties of fiber flax. Flax is the plant that linen comes from. The Latin name, Linum usitatissimum, tells you it’s the “most useful” plant, and highlights how important flax has been for thousands of years as a source of fiber. 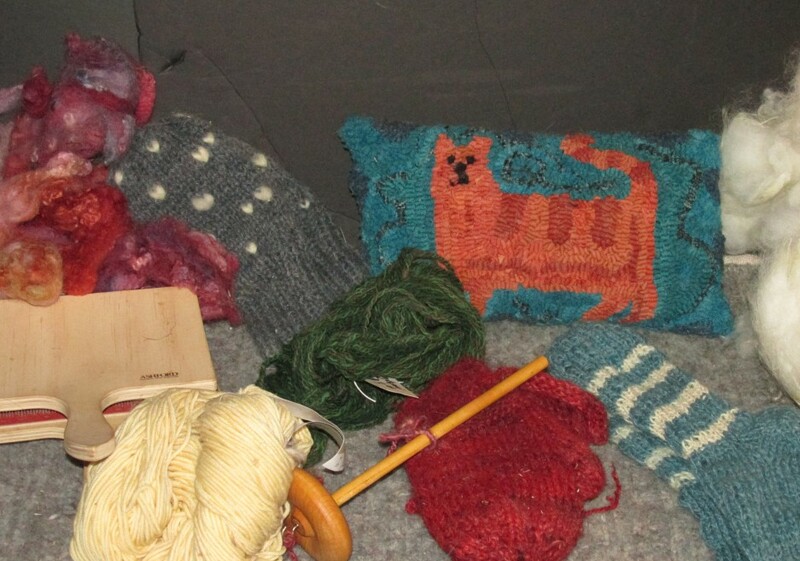 The fiber has been used for yarn, thread, rope, fine and rough cloth, sails, and a multitude of other purposes. Flax is a bast fiber, meaning that the fibers are found in the stalk of the plant. Growing flax isn’t too tricky, but getting the fiber out of the stalks is a long and complicated process. In agricultural communities before the Industrial Revolution, the knowledge of how to grow and process flax was commonplace. However, since this crop is no longer widely grown, knowledge is harder to come by. I’ve been learning to grow and process flax for over ten years. I’m still learning, and every season brings as many questions as answers. Learning by trial and error is slow, so a few years ago I was thrilled to meet up with some other flax and linen enthusiasts, and form the New England Flax and Linen Study Group. I learned so much from the enthusiasm and support of this group. In our quest to learn more, we hatched the plan to organize a symposium, where we hoped to bring together as many knowledgeable people as possible to share experience and advice. The symposium will be Saturday and Sunday August 20-21, 2016 at Historic Deerfield, and is organized in collaboration with Historic Deerfield. We’re proud to say that registration is now open for this symposium! You can learn more about the symposium on our website (http://newenglandflaxandlinen.org/) and can register on Historic Deerfield’s website (http://www.historic-deerfield.org/event/seminars/flax-and-linen-following-thread-past-present/). On this FIBERuary blog, I’d like to share some of the steps involved in growing and processing flax. Step one is getting seeds. If you want to plant flax this season, you should order your seed now. Flax is typically planted early in the spring, as soon as the ground has thawed but while it’s still wet. Usually around here you can plant in April, though this winter has been so mild we may be set for an earlier planting date this season. If you are growing flax for the fiber, rather than for edible seed, make sure you have bought a fiber flax variety such as Marilyn, Evelin, Viking, or Ariane. Two reliable sources for fiber flax seed are The Hermitage in Pennsylvania (http://flaxforsale.com/) and Landis Valley Village and Farm Museum’s Heirloom Seed Project (http://www.landisvalleymuseum.org/index.php/programs/heirloom-seed-project/).